Since the 1990s, experience-oriented historical communication has been steadily increasing. Yet in-depth research of forms of historical representation and acquisition such as museum theatre, themed walks, or time travel within docu-soaps has remained minimal. Beginning in 2011/12, the fellows of the interdisciplinary research project, Living History: Reenacted Prehistory between Research and Popular Performance, in which historians, archaeologists, and European ethnologists participate and collaborate, have been applying themselves to the examination of these manifold performance-based practices of representation, communication, and acquisition of the past. The research is done from the German perspective framework and differs in some ways from Scandinavian, British and American models. First, our contribution gives a brief overview of the joint research concept. After all, living history is not only an interesting research field from an archaeological and museum educational perspective, but applicable to contemporary studies and cultural analysis. Subsequently, we will present the sub-projects and preliminary research results. As live interpretation in general play an increasingly significant role in questions of education and acquisition, the three projects share a broadly defined concept of living history in terms of physicality. Simultaneously, our presentation clarifies that such differing practices are based on different constructions and negotiations of knowledge. Experience is much more easily recollected than information that is, for example, read. Emotions play a particularly important role in achieving the ‘correct’ experience. For many years, the public has become increasingly aware of historical and archaeological topics, a phenomenon to which large-scale and well-attended exhibitions, so-called ‘medievalmarkets’, the continual success of historical TV-documentaries, and a booming market in specialized books and magazines may attest. Living history formats on television or historical docu-soaps also attract millions of viewers (see, for example, Schwarzwaldhaus 1902, SWR 2002; Steinzeit– DasExperiment, SWR 2007). Remarkably, documentaries on pre -and protohistory1build a large contingent of German historical TV programs beyond those on World War II. Moreover, this period in particularis popularly represented in open-air museums, memorial culture, or themed walks, such as, for example, the crossing of the Alps ‘in the steps’ of Ötzi ‘the Iceman’. While these approaches to ‘popularhistory’ or living history have been en vogue for at least two decades, academic historical research has only recently discovered this field of study. First, our project examines the production of living history, particularly in its relationship to academic history, which includes an analysis of didactical concepts, reenactors’ professional and personal backgrounds, and their motives. Second, an analysis of the presentations and performances themselves, their narratives, visualizations, realizations, and staging techniques is provided. Third, the project includes an investigation of the experiences of participants and viewers, their emotional processing and involvement. In this work, we will present brief overviews of the three sub-projects as well as some preliminary research results. As live interpretation generally play an increasingly significant role in questions of education and acquisition, the three projects share a broadly defined concept of living history in terms of physical dimensions of experience. Despite other definitions, we use the term living history as an umbrella concept for different phenomena of sensory approaches to constructions of the past, since one of our research goals is to shed light on the specifics of embodied knowledge and this concept departs from means of interpretation. Finally, it will be illustrated that the different practices are based on different constructions and negotiations of knowledge. The focus of the archaeological sub-project of this interdisciplinary undertaking lies in time travel. 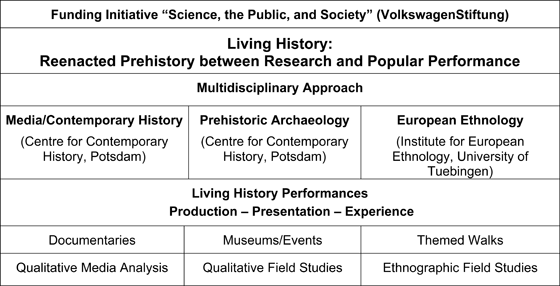 Research is directed at the interactions between professional archaeologists, performers, and visitors (scholars, actors, and recipients) in selected German archaeological open-air museums and at historic events. The main objective of this research is to investigate the motives, agenda, and meaning of time travel performances for all participants. A second major aim is to explore the performers’ personal and professional background and their relation to academic research and didactical concepts. Finally, an important objective is concerned with whether, and if so to what extent, the audience exerts an influence on the performers. In order to implement the sub-project’s objectives, different methods of qualitative research are used. The fieldwork focuses on a series of open observer techniques (such as photos and observance reports) and guided interviews with selected actors of reenactment groups and individual participating performers. This includes guided interviews with directors of open-air museums. Since the beginning of the project, seven performers and two curators have been interviewed. In addition, short visitor surveys were conducted and a web-based questionnaire on reenactors’ motives, their amount of work, and their understanding of the terms ‘living history’ and ‘reenactment’, and the concept of ‘authenticity’ was developed. About 170 reenactors from all over Germany completed the questionnaire, which ran for thirty days in June 2013. While the questionnaire, which serves as a correlation to the interviews, has not yet been evaluated, we will present some insights into the interviews conducted, which aid in illustrating the potential of and limits on living history in open-air museums (for more details, see Samida in press). However, particularly problematic for a museum is the balancing act between education and entertainment, which accompanies, for instance, the inclusion of living history performances. First, the open-air museum must participate in the modern leisure market, which is ultimately defined by the visitor of the so-called ‘experience society’ (Erlebnisgesellschaft) and its frame of expectations. Yet there are limitations on this participation, as certain aspects cannot be performed affectively for ethical reasons (e.g., features of an archaeology of religion and ritual, such as a child immolation). Moreover, the interviewed curator understood that from a museum’s perspective, “stagings in form of time travels [do] not make representations of the past more credible and more scientifically precise” (interview with RB, 28 November 2012).Indeed, this is often quite the contrary as in most cases popular scientific performance introduces problems with its bodily and affective presentation, because the presented images make a much stronger statement and have a much stronger effect than, for example, textual representation. It is arguable that by means of staging performances, interest in the past is aroused in an entertaining manner whereby mediated images and living environments make an extraordinary impression on the audience because of the emotive approach to the past that actively involves both the performers and the audience. Yetthere is a certain danger that such performances create not only false, but also misleading images of the past. Museum presentations are especially affected by this, as visitors give them particular credence, a notion Carolyn Oesterle (2010, 171) makes clear: “The danger then consists in an uncritical absorption and internalization of sanitized versions of history that may be based on privileged knowledge, prevalent stereotypes, or worse, outright propaganda”. This might include the presentation of clichés and stereotypes such as Celtic druids cutting mistletoe, or the instrumentalization of history by esoteric groups, neo-pagan religions, or right-wing extremist circles (see Mölders and Hoppadietz 2007; Banghard 2009). Because reenactors are aware that total immersion or entrance into the past is not possible, the question remains as to what extent the past can actually be experienced or relived at all. As one interviewee noted, one is not an ancient Celt, but merely attempts to play one. Is living history therefore only a play, which tells us nothing about the past but only confronts us with a mirror of the present? Is living history just another event in our ‘experience society’? From an academic perspective, the answer remains, “Yes, but….”. As previously mentioned, living history certainly has negative effects. It promises too much, the past is gone and cannot be repeated. Hence, living history is an ambivalent social phenomenon, which tells us more about the present than the past itself. However, living history has a great deal of potential in that it can be understood as a kind of ‘history from below’. Although it does not always deliver a scientific view of the past, living history, as the interviews illustrate, often addresses quite different historical questions than those posed by academics. Thus, one has to agree with the Australian historian Alexander Cook (2004, 495) who states “reenactment can offer no answers” but it certainly “raises questions”. The media sub-project analyzes the representation of prehistory in German and British television documentaries in the last five decades.4 In contrast to contemporary history on TV, there are some difficulties in staging prehistory. There are, of course, no audio or video sources preserved from the Stone Age, and there are certainly no contemporary witnesses. However, the mere presentation of fossils is simply not enough for recent viewing habits (Hoffmann 2012, 28). Ironically, televised prehistory thus creates a large imaginary space for the producers of non-fiction programming. This research attempts to expose how deeply the development of staged prehistory has been affected by changes in film technology and the influence of West-European ‘knowledge’ and ‘experience society’ since the 1970s (see Stehr 1994; Schulze 2005), while looking closely at the relation between science and television in Britain and Germany during this period. There was and continues to be a popularization of academic sciences as active and passive process. Film producers stage scientists who, with their techniques and methods, often position themselves as protagonists with individual goals. Growing commercial pressure on the TV-producers during this period came about as society continued to gain more leisure time, which increased demand for amusement. In addition, the importance of higher education grew and began to be viewed as a necessity for success in society. These two developments helped form a close relationship between education and entertainment, spurring the growth of so-called, ‘edutainment’ or ‘histotainment’ formats. Prehistory was and still is staged in a way that generates moods and atmospheres. While viewers used to see shadows on TV that were meant to represent prehistoric men, reenactments are now the more popular mode of representation. Reenactments show extensive re-imaginations of the past, which illustrate prehistoric everyday life, and allow our oldest ancestors to speak in invented ‘prehistoric-like’ languages. Documentaries are written as unambiguous narratives. In focusing on prehistoric protagonists, the reenactments follow a personalized and dramatized plot. In addition, such broadcasts have strong master narratives in their overall composition. For example, evolution is staged as a linear history of progress, while docu-soaps present a basic way of life that contrasts with our complex contemporary society (for example:Die Odyssee des Menschen, ZDF 2001; Steinzeit – Das Experiment, SWR 2007). These meta-plots follow the rules of traditional TV genres. Throughout the reporting period from 1970 until today, one may see evolution depicted as a romance and stories told about Neanderthal man presented as tragedies (e.g., Der Neandertaler – was wirklich geschah, ZDF 2006). Lastly, prehistory becomes a setting by which to engage in contemporary discourses. Archaeology is condensed into the form of a natural science and deals with philosophical questions about what it means to be a human and the relation between human and nature in times of growing ecological awareness.On the interrelationship between archaeology and science, see Samida/Eggert 2013. From the audience’s point of view, there is no corporeal experience of the past. This sub-project deals with a staged and mediatized form of living history. Living history elements have been set into documentaries in order to offer a mental and emotional access to history, with the aim of entertainment, by which the audience constructs their own imaginative understandings of the past. Nevertheless, the reviewed documentaries offer an exposed view into the development of a postmodern society; its discourses and self-conceptions can be seen through an analysis of their constructions of the farthest past. The chalcolithic mummy, which had been accidently found by a mountaineering couple at a high pass in the Rhaetian Alps in 1991 and became famous as Ötzi, or ‘The Iceman’, was a sensational discovery that provoked a great deal of archaeological research and tourism at the Hauslabjoch, the area around which it was found. While the archaeological digs were geared toward popular hiking trails that connected the northern and the southern part of the region, some of the established hiking trails that connected important sites were dedicated to the archaeological findings. Information boards about prehistoric settlements in the alpine territory were set up at selected places around the Hauslabjoch. In 1998, a hiking guide was published, which described several trails between the sites in Tyrol, Austria and the Italian South Tyrol (Bodini 1998). Here, the interdependencies between science and popular culture become especially clear and provide the ideal foundation for an investigation of the dynamics of such relationships and popular practices of creating historical knowledge. Core concepts of this research consistently touch on the concept of performativity (Fischer-Lichte 2004).Here, emotions are defined as cultural practices, which in turn are actions taken in order to have, manage, communicate, or regulate certain experiences (Scheer 2012). In line with Bourdieu’s concept of habitus, emotional practices may also cohere to certain emotional styles (Gammerl 2012). These emotional practices are connected to the body and may be understood as manifestations of culture. This study builds on the assumption that experiences are multisensory and depend on culturally based sensory orders (Geurts 2002) and material aspects of space (Böhme 1995). The ethnographic methodology used consists of observation, auto-ethnography with psychoanalytical supervision, mobile interviews, and several visual methods, which included photographs, mental maps, and GPS-tracks. The material discussed during the conference was based on interviews conducted during a six-week period of field research in the Alps in the summer of 2012. During this time, hikers on the archaeological trails in the area were accompanied on their walks or were interviewed at characteristic sites along the trail network. Some of the mobile interviews and observations lasted for more than seven hours. However, such interviews should not be understood to be constant barrages of questions in a questionnaire-like format. Instead, they were itinerant conversations that were primarily influenced by the surroundings and, secondly, by the questions of the ethnographer. For example, hikers were asked to describe the places they were experiencing and to share their impressions with the ethnographer. Three aspects of knowledge circulation on these hiking trails, which were introduced at the conference, form the basis for characterization of themed hiking as a phenomenon of living history. 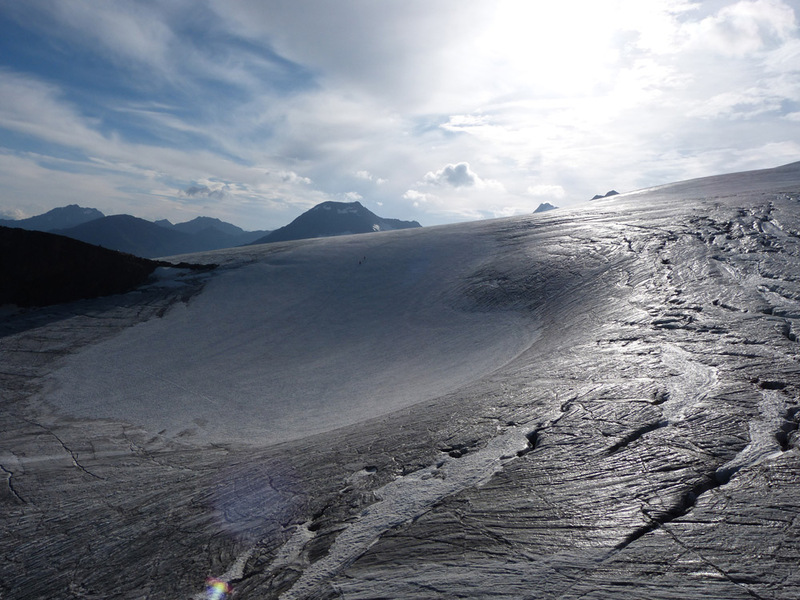 The first aspect concerns the experience of high alpine landscapes in their totality (See Figure 2). ME was raised in simple conditions and was often left on her own, creating experiences of loneliness that are still with her today. For her, mountaineering is an attempt at self-therapy, to create positive experiences, and to gain self-assertion. She lives on these experiences in everyday life. Simultaneously, the hostile environment of the high alpine territory scares her and reminds her of moments of helplessness and despair in her childhood. She interprets prehistoric living conditions through her childhood experiences and her current encounter with the alpine landscape. This participant was interviewed directly at the location at which the mummy was found. With very little experience in mountaineering, he had accompanied some vague acquaintances in order to reach the location of Ötzi’s discovery. He found the path to be especially difficult and was very proud that he had finally made it. Based on his experiences, he develops an interpretation of the circumstances of Ötzi’s death. He does not differentiate between his own abilities and emotional needs, and those he assumes Ötzi had and experienced. He projects his perception of a hostile environment in which he would not have wanted to be alone, onto a historical personality and thus, initiates a construction of history. 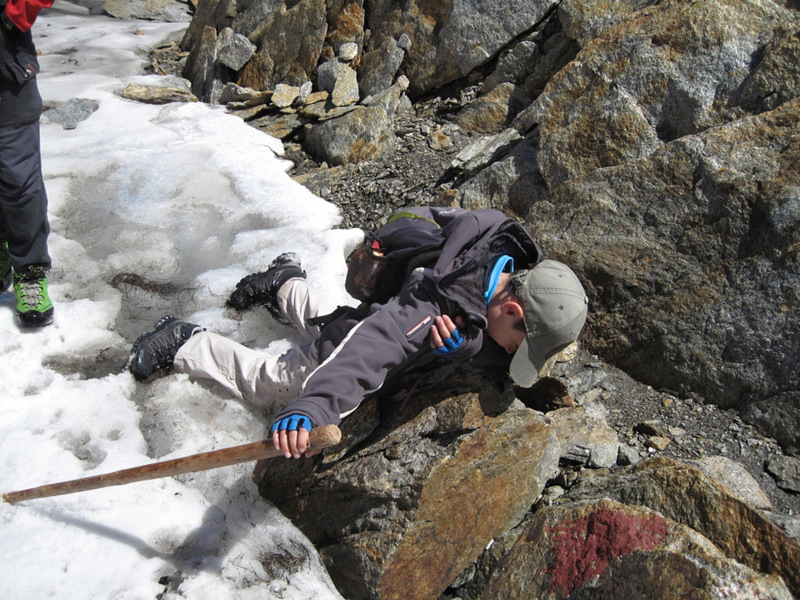 Others even try to reenact the position in which Ötzi was found (See Figure 3). HP refers to his own experiences at the place of Ötzi’s discovery to develop an interpretation of prehistoric people’s motivation for going into the mountains, especially at this specific location. He accentuates sense perception, commingling it with the concept of empathy, which he practiced at this place, in order to interpret the past. Even if the territory has changed immensely, in terms of, for example, the structure of the mountainside and the position of the tree line, the experiences of good hunting are a reference point for an interpretation of past motivations to go up the mountain pass. Other interviewees report having felt disappointment upon their arrival at the finding place and discovering that it carried no particular aura for them. Others, who pay a great deal of attention to being individualistic, often decide not to go to the place because of its popularity among tourists, and their own distaste for the therein-resulting crowds. Certainly, such individuals may develop very different kinds of interpretations of the past. These three aspects represent a small outtake of the work in progress. While they have been disassembled for the sake of analysis, in actuality they ought to be understood in connection to one another as part of the process of performing knowledge in open-air venues. Their characteristics concern the experiences of landscape, which trigger biographical memories that are applied to historical constructions. They also offer and utilize sensual experiences that coin understandings and build the scenery of history interpretations. These hitherto rarely considered aspects of knowledge acquisition question the rhetorical boundaries between experts and laity, as they are an important basis for individual constructions of history as well as an access to dynamics of scientific research. The aim of this article was to present different approaches to understanding our subject matter. The title of this paper indicated intent to explicate similarities and differences between three different living history phenomena, which deal with performances of images of prehistory. All of the sub-projects presented have discussed aspects of affective experiences as well as ahistoric dimensions of body and space in regard to knowledge circulation. The archaeological sub-project focuses on reenactors’ experiences and motives in which emotional encounters play an important role. Therefore, performances at popular historic events and in archaeological open-air museums, as well as the interrelationship of participants involved in such events are analyzed. Of particular interest is the dynamic of a “history from below,” which characterizes the tense relationship between lay people and professionals, and often forces academics to draw the line between entertainment and science. The sub-project, which focuses on reenactments in TV-documentaries, examines mediatized stagings of academic knowledge. As has been shown, it is possible to identify linear narratives of past environments. In addition, within these well-staged constructions of history, contemporary discourse on sustainability, the relation between man and nature, and life in a western consumer society may be uncovered. Thus, contemporary social self-reflection is relocated into the past, by way of prehistoric setting. Finally, the ethnographical sub-project observes how hikers’ interest, as well as their affective, emotional, and space-related experiences on archaeological themed walks feed constructions of history. Thus, contemporary practices and experiences are transferred into the past and generalized. As a result, conclusions about the past or modifications on preexisting historical knowledge are made. The narratives are similar to those, which were identified by the documentary analysis. The living history phenomena illustrated here differ in their level of mediatization and the intensity of individual incorporation. Living history performances offer actors experiences in which visitors can also affectively participate. Historical TV-productions, in contrast, focus on the audience and offer convenient contemporary narratives, which can be adopted or interrogated. Here, the performers are actors or participants of an ‘experiment’, which is determined by a script. Thus, the audience can sympathize with but not experience the televised content. Themed walks in alpine areas connect various dimensions of experience and result in identification with historic topics of particular areas. In addition, the analyzed phenomena vary in terms of their relation to academic archaeology. While we quite often observe archaeologists as reenactors, wishing to do research and transfer knowledge, archaeologists in TV-documentaries resemble actors playing the role of an expert. In such cases, science is staged as an epistemic authority. Archeologists usually establish archeological themed walks, but the historic interpretations of these walks lie with the hikers. Despite these differences, in each case, the roles and competences of those involved overlap. In short, what these varying living history performances have in common is that they are not obligatorily tied to museums but that they provide links for historical interpretations. The material quality of space and the actors’ emotional and bodily integration play an essential role for sophisticated understandings of the past. As such, space, emotion, and body should be understood as epistemic entities of knowledge acquisition, which because the dynamics of knowledge circulation are complex and do not necessarily adhere to academic knowledge systems, necessitate analysis. Yet these entities provide many links for the actors’ individual questions. Experts should support these individual processes of adoptions of the past with contextualization and, ultimately, reflect these processes. 1. The term ‘prehistory’will be used as including both pre- and protohistory for the remainder of this text. We would like to thank Eszter Kiss (Potsdam) for providing a Hungarian abstract and Angela Allmendinger (Tübingen), who corrected our English and made it more comprehensible. 2. For more project details see Samida 2012 or . 3. Interviews in this paragraph were conducted in German. All translations were provided by St.S. The interviewer’s questions and expressions, as well as interjections, stammering, and overlappings were eliminated. # indicates partial words or sentences, in which the speaker restart his/her thoughts. 4. This sub-project is supervised by Frank Bösch and conducted by Georg Koch (both Centre for Contemporary History Potsdam). 5. Until now, most academic research projects have examined living history formats with a focus on modern history. It is of interest to note how far ‘living prehistory’distinguishes itself from these broadcasts (see Fenske 2007). 6. The sub-project is based in Tübingen and supervised by Bernhard Tschofen, Institute of Popular Culture Studies, University of Zurich. Primarily, this research addresses the hiker’s experiences of atmosphere and their own bodily and emotional practices. Az 1990-es évek óta egyre elterjedtebb a történelmi tudás élményorientált átadása. Òriási a közönség érdeklődése a középkori vásárok, az ősemberek életét bemutató ismeretterjesztő filmek és a szabadtéri múzeumokban előadott “színházi“ előadások iránt. A tematikus túrák vagy a doku-soap formába bújtatott időutazások is mind olyan formái a múlt felidézésének valamint elsajátításának, amely eddig elkerülte a kutatók nagyrészének figyelmét. A Living History (élő történelem): Felelevenített őskor a tudomány és a népszerű bemutatás között nevű projekt kutatói a legkülönfélébb tudományágak, így a történelem, régészet illetve az empírikus kultúrtudományok képviselői. A kutatócsoport 2012 óta foglalkozik a múlt ebbéli megjelenítéseinek sokszínű, performatív praktikáival. Azt vizsgálja, melyek a történelmi mondanivaló közvetítésének és befogadásának lehetőségei. Az alábbi tanulmány röviden ismerteti a kutató projekt egészét. A ‘Living History’ nem csak régészeti és múzeumpedagógiai szempontból érdekes kutatási terület, hanem forrásanyagot is nyújthat a jelenkor történelmének vizsgálatához valamint a kultúraanalízishez. A ‘Living History’ kutatás lehetőségeinek ismertetését követően a cikk bemutatja az egyes részprojekteket, valamint azok első eredményeit. Stefanie Samida az őskori történelem szabadtéri múzeumokban látható teatrális megjelenítését kutatja. Georg Koch ezzel szemben olyan német és brit TV műsorokat analizál, amelyek az 1970-es évek óta az őskori életformákat tárják a közönség elé. Sarah Willnert végül az a kérdés foglalkoztatja, hogy milyen a történelmi tudás elsajátításának folyamata a régészeti tematikus kirándulások keretein belül. Willner azt az alpesi hegymászó túrát vizsgálja meg közelebbről, amely elvezet egészen Ötzi, a gleccsermúmia megtalálásának helyszínéig. Mind a három projekt esetében lényeges a következő szempontok figyelembe vétele: a tudomány és a ‘Living History’ közötti kölcsönhatások, az előadók illetve résztvevők képzettsége, valamint motivációja, a műsorok didaktikus alapelvei, az előadások narrációja, megvalósítása és az előadás módja, végül pedig a résztvevők tapasztalatai. Ezen felül a projektekben a ‘Living History’ fogalmának nyílt értelmezése is közös, a tekintetben, hogy a megvizsgált történelmi praktikák átélésénél a testi dimenziót is mindenkor szem előtt tartják. Az élő interpretációk (Live Interpretations), mint az őskori tűzrakás bemutatása, vagy harci jelenetek eljátszása, mellett a ‘Living History’ más formái (TV-műsorok, túrák) is egyre fontosabb szerepet kapnak az ismeretterjesztésben és tanulásban. A cikk nem utolsó sorban arra utal, hogy a történelem megjelenítésének különféle praktikái a tudás sokféle konstrukcióján és annak “kialkudásán“ nyugszanak. BANGHARD, Karl (2009): „Unterm Häkelkreuz“. Germanische Living History und rechte Affekte. Ein historischer Überblick in drei Schlaglichtern. In: Hans-Peter Kilguss (ed. ), Die Erfindung der Deutschen. Rezeption der Varusschlacht und die Mystifizierung der Germanen. Dokumentation zur Fachtagung vom 03. Juli 2009 (Köln 2009), 29–35. BODINI, Gianni (1998): Auf den Spuren des Mannes aus dem Eis. Schnalstal, Vinschgau, Vent (Schnals 1998). BÖHME, Gernot (1995): Atmosphäre. Essays zur neuen Ästhetik (Frankfurt a. M. 1995). COOK, Alexander (2004): The Use and Abuse of Historical Reenactment: Thoughts on Recent Trends in Public History. In: Criticism 46(3), 2004, 487–496. FENSKE, Michaela (2007): „Geschichte wie sie Euch gefällt“. Historische Doku-Soaps als spätmoderne Handlungs-, Diskussions- und Erlebnisräume. In: Andreas Hartmann et al. (ed. ), Historizität. Vom Umgang mit Geschichte (Münster 2007), 85–105. FISCHER-LICHTE, Erika (2004): Ästhetik des Performativen (Frankfurt a. M. 2004). GAMMERL, Benno (2012): Emotional Styles – Concepts and Challenges. In: Rethinking History 16(2), 2012, 161–175. GEURTS, Kathryn Linn (2002): Culture and the Senses. Bodily Ways of Knowing in an African Community (Berkeley, Los Angeles, London 2002). HOFFMANN, Kay (2012): Die Wirklichkeit schmilzt dahin wie Schnee unter der Sonne. Von der Inszenierung im Dokumentarfilm. In: Ibid. et al. (ed. ), Spiel mit der Wirklichkeit. Zur Entwicklung doku-fiktionaler Formate in Film und Fernsehen (Konstanz 2012) 21–40. MÖLDERS, Doreen and Ralf HOPPADIETZ (2007): „Odin statt Jesus!“ Europäische Ur- und Frühgeschichte als Fundgrube für religiöse Mythen neugermanischen Heidentums? In: Rundbrief Theorie-AG 6(1), 2007, 32–48. OESTERLE, Carolyn (2010): Themed Environments – Performative Spaces: Performing Visitors in North American Living History Museums. In: Judith Schlehe, Michiko Uike-Bormann, Carolyn Oesterle and Wolfgang Hochbruck (ed. ), Staging the Past: Themed Environments in Transcultural Perspectives (Bielefeld 2010), 157–175. SAMIDA, Stefanie (2012): Reenacted Prehistory Today: Preliminary Remarks on a Multidisciplinary Research Project. In: Nina Schücker (ed. ), Integrating Archaeology: Science – Wish – Reality (Frankfurt a. M. 2012), 75–80. SAMIDA, Stefanie (in press): Performing the Past: Time Travels in Archaeological Open Air-Museums (manuscript). SAMIDA, Stefanie and MANFRED K. H. Eggert (2013): Archäologie als Naturwissenschaft? Eine Streitschrift (Berlin 20132). SCHEER, Monique (2012): Are Emotions a Kind of Practice (and What Is That What Makes Them Have a History)? A Bourdieuan Approach to Defining Emotion. In: History and Theory 51, 2012, 193–220. SCHULZE, Gerhard (2005): Die Erlebnisgesellschaft. Kultursoziologie der Gegenwart (Frankfurt a. M., New York 2005). STEHR, Nico (1994): Arbeit, Eigentum, Wissen. Zur Theorie von Wissensgesellschaften (Frankfurt a. M. 1994).